Yards need a combination of softscape and hardscape to look balanced and beautiful. With hardscaping, your property will look more like a wild forest than a backyard. These features can act as a central point for your landscape, adding dimension and decoration. Use this guide to learn how you can incorporate elements of hardscaping into your landscaping design. 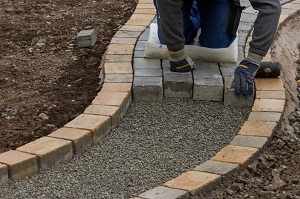 Read on to learn more about the different materials you can include in your hardscaping. If you want to build a deck or patio in your yard, wood is probably your top choice. This popular material is available in a number of varieties and finishes, which can be selected to match the design of your house and yard. Many homeowners choose wood because of its natural and warm feel. Consider using composite decking for your patio hardscape in Suwanee instead of wood or aluminum. This material is super durable, requires little maintenance, and is resistant to mold, rotting, and insects. It is also an environmentally friendly option as it is made from recycled plastics and wood fibers. The only downside to composite decking is its high price. Brick is an ideal material to use in hardscape elements like pathways, walls, and landscape edging. This material has been used for centuries and continues to look great wherever it is. You can select the type of brick and the laying pattern to give your yard the exact look you want. Brick is also an eco-friendly material to use in your hardscaping in Suwanee. A growing trend in hardscaping is including loose materials in your landscape design. These materials include gravel, small stones, recycled glass, rubber mulch, and more. Free materials are not everyone’s style, but they can look great when used to make pathways, edging, and pool surroundings. Stone landscaping has a way of adding sophistication to any outdoor area. Flagstone and natural stone are both popular choices for courtyards, patios, and other areas. Plus, it can be used to suit any style, from natural and rustic to luxurious and formal. It all depends on the type and look of the stone you choose. Pavers are pre-made slabs of material that can be laid and arranged any way you choose. 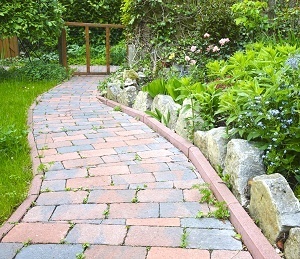 You can decide to use pavers for paths, stepping stones, patios, and more. The most popular types of pavers are made of brick, concrete, and flagstone.